Hanover, VA – On Wednesday, August 12, 2015, at approximately 7:10 p.m., the Sheriff’s Office responded to the Famous Footwear located in the 7200 block of Bell Creek Road for a report of a robbery. The suspect entered the store, picked out a pair of shoes and approached the counter. At that time, the suspect produced a handgun and ordered the clerk to put the money from the register in the shoebox. The suspect took the shoes and money and fled the store on foot. 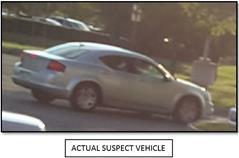 Attached is a photograph of the suspect’s vehicle as it fled the parking lot. The vehicle is believed to be a silver Dodge Avenger, 4-door. The suspect is described as a white male in his mid- to late- 20s, 5’7” to 5’8” tall, 230-250 pounds, with reddish-blond hair.